There is so much wonder in the world around me. It is useless spending my waking moments dwelling on an unfortunate situation. Disappointing circumstances are quickly replaced by beauty when I open my eyes and look around. Meeting financial goals is important to me. I look forward to the day when I am debt free. Although that opportunity is far away, I remain positive. Each chance I miss to clear my debt is another chance to build greater financial discipline. I realize that each delay is preparing me to avoid the same monetary missteps in the future. I embrace the opportunity to adjust my approach. When I feel let down by a friend, I avoid feeling unimportant in that moment. I remind myself that each of us is human and deserving of forgiveness. Choosing to forgive my friend for forgetting something important to me opens my heart to receive the other blessings that they provide. I realize that one negative instance is far from enough to color the true characteristics of someone. Dwelling on a missed opportunity is useless. I shift my focus to positive thinking, instead. My mind controls my emotional response to things. I make a conscious effort to focus my energies on the good things around me. That approach allows me to move on from a tough time and embrace the good that surrounds me. Today, my disappointment is fleeting. 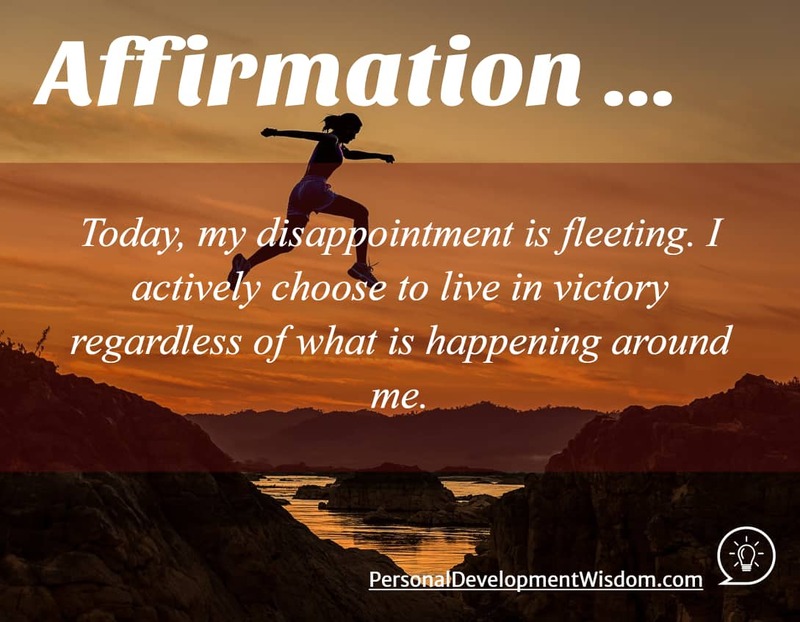 I actively choose to live in victory regardless of what is happening around me. How much disappointment do I feel when a loved one lets me down? What are some of the things that I do to cause disappointment in myself? How do I move on from an unfavorable outcome?